Le Corporate Hotel est situé à 800 mètres du parc d'attractions national et à 3 km de la gare d'Oulan-Bator. Cet établissement 4 étoiles propose un centre de remise en forme, un spa et un parking gratuit. Par ailleurs, une connexion Wi-Fi gratuite est disponible dans toutes les chambres de l'hôtel. Spacieuses et climatisées, les chambres disposent d'un mobilier moderne. Chacune est équipée d'un bureau, d'un coffre-fort personnel et de la télévision par satellite. Elles comportent également du matériel de repassage, un minibar et un plateau/bouilloire. Faites-vous plaisir avec un massage au spa ou détendez-vous dans le sauna. Des services de blanchisserie et de nettoyage à sec sont proposés. Une bagagerie est par ailleurs disponible à la réception ouverte 24h/24. Le restaurant Chairman propose une sélection de plats mongols. L'Hotel Corporate est situé à 15 km de l'aéroport international Gengis-Khan. Located at the central area of Ulaanbaatar, Kaiser Hotel is an 8-minute walking away from Parliament House of Mongolia and Sukhbaatar Square. Renovated in April 2013, it provides homely accommodation with free Wi-Fi in all areas. The hotel provides airport shuttle services at an extra charge. 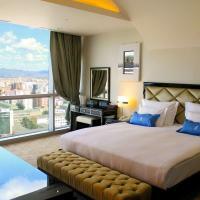 Kaiser Hotel is 1.5 km to the Natural History Museum of Mongolia and 5 km from Ulaanbaatar Train Station. Chinggis Khaan International Airport is 15 km away. Rooms at Kaiser are equipped with a TV and minibar. En suite bathrooms come with a shower and toiletries. Guests can play a game of billiards or make sightseeing and ticketing arrangements at the tour desk. Laundry services are available. Free private parking is possible on site. A variety of European and Mongolian dishes are provided at the restaurant of Kaiser. Breakfast can be enjoyed in the rooms as well. Located just beside Mongolia International University, the luxurious Sunjin Grand Hotel boasts a wellness centre, karaoke facilities and a hot tub. The 4-star upscale rooms come with a coffee machine and free wireless internet. On-site parking is free. 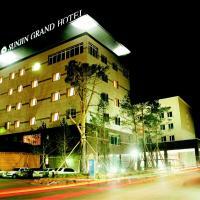 Sunjin Grand is a 15-minute drive from Ulaanbaatar Railway Station and a 30-minute drive from Ulaanbaatar Airport. All well-decorated rooms are fitted with air conditioning, a minibar and a cosy seating area. En suite bathrooms include free toiletries, hairdryers and shower facilities. Guests can work out at the gym, enjoy a soothing massage treatment, or unwind in the sauna. Billiards, business centre and meeting rooms are also available. There is a cash machine and a gift shop on site for guests’ conveniences. Mongolian and European food can be enjoyed at Pharos, while Keun Janbi has Korean dishes on its menu. Other dining options include Safari Japanese restaurant and Harry’s night club. Located in the heart of Ulaanbaatar city, Puma Imperial Hotel is surrounded by National Historical Museum, Natural History Museum, Science Cultural Centre and Central Post Office. It offers several meeting rooms and accommodation and 3 dining options. Free Wi-Fi is provided. Puma Imperial Hotel is a 10-minute drive from the Railway Station. Chinggis Khaan International Airport is a 16-minute car journey away. Decorated in Russian style, each guestroom is fitted with a flat-screen TV with cable channels, a writing desk and an electric kettle. The attached bathroom has a walk-in shower and a bathtub. Guests can rent a car to explore the surroundings, or catch up with the last-minute work at the business centre. Hotel provides a 24-hour front desk and currency exchange service. Enjoy a fine selection of European and Mongolian specialties at Puma Restaurant. Delhi Darbar Restaurant provides authentic Indian flavours. Gourmet coffee, snacks and light meals are served at Puma Coffee Shop.